The MB-60E EI system is used to make internal and external fire doors, single or double. This system also allows the execution of so-called technical windows and fire partition walls. Structures made on the basis of the MB-60E EI system may have fire resistance classes EI 15, EI 30 according to PN-EN 13501-2 + A1: 2010. The system is classified as non-fire spreading (NRO). The MB-78 EI system is used to manufacture internal or external fire partitions with one- and two-leaf doors with fire resistance class EI 15, EI 30, EI 45, EI 60, according to PN-EN 13501-2: 2010. Numerous studies and calculations have also proved that the products made of this system have very good thermal insulation (Uf from 1.60 W / m2K) and acoustic (up to 40 dB). 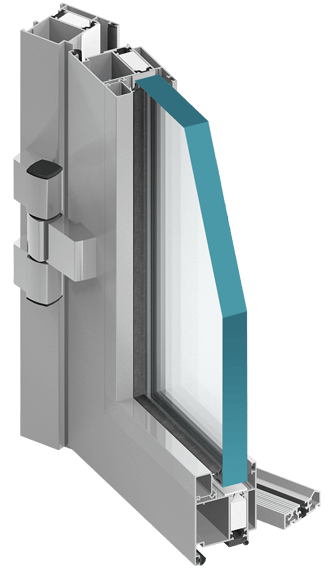 Due to its properties, optimization of technology and production costs, compatibility with other ALUPROF window and door systems and consistent technical development, it is a very popular product in its class and used on the construction market in a wide range. The construction of the MB-78EI system is based on thermally insulated aluminum profiles, the depth of which is 78 mm. They are characterized by a low value of the heat transfer coefficient due to the use in their construction, among others special profiled thermal breaks with a width of 34 mm. The resistance of the structure to high temperature is ensured by special elements of GKF or CI fire insulation introduced into the internal chambers of the profiles and into the insulation spaces between the profiles and steel accessories and connectors. The thickness of fillings in the MB-78EI system is from 6 to 49 mm. The fillings can be all typical fire-resistant glazing as well as layered non-transparent elements made of sheet metal and appropriate boards providing the required fire protection. As part of this system, smoke-tight constructions can also be obtained. The angled walls available in the system, the possibility of bending profiles and the construction of arch structures, as well as the use of slanted bindings and decorative muntins glued on glass are the features that affect the shapes and aesthetics of the building. The range of permissible dimensions of the structure includes fixed divisions up to 4 m high, and closing doors with wing sizes up to 1.4 x 2.5 m. The doors of the MB-78EI system can be assembled individually, as part of larger glazed wall structures, and in fire-resistant façades. MB-SR50EI and MB-SR50N EI systems. Large design possibilities, freedom of choice of different hinges, locks, door closers and other fittings as well as optimized production technology are not the only advantages of this system. 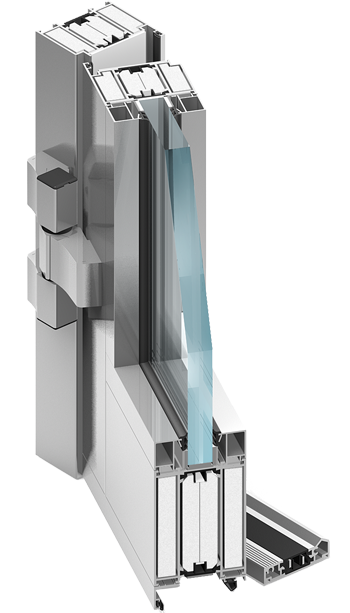 It also allows you to perform automatic sliding doors MB-78EI DPA with fire resistance class EI15 or EI30, it is also the basis for the construction of walls MB-118EI, enabling the fire resistance in class EI120.